My camera has been acting wonky lately so the photos that I took last month didn’t turn out very well. So instead, I’ve got photos of these Pecan Turtle Shortbread Thumbprint Cookies that seem to be the most decent out of the bunch I took. They start off with the same buttery, melt in your mouth shortbread base. I love this dough because it seriously does not spread much at all. cornstarch which is the key to keeping the cookies nice and soft with no spreading..
Next comes the melted caramels which we add to the filling. 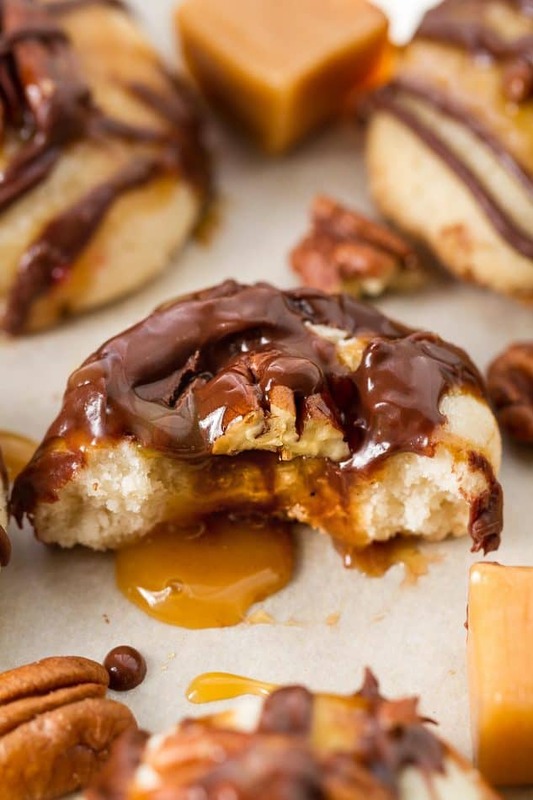 We top them off with crunchy pecans and a drizzle of melted chocolate and melted caramel sauce. 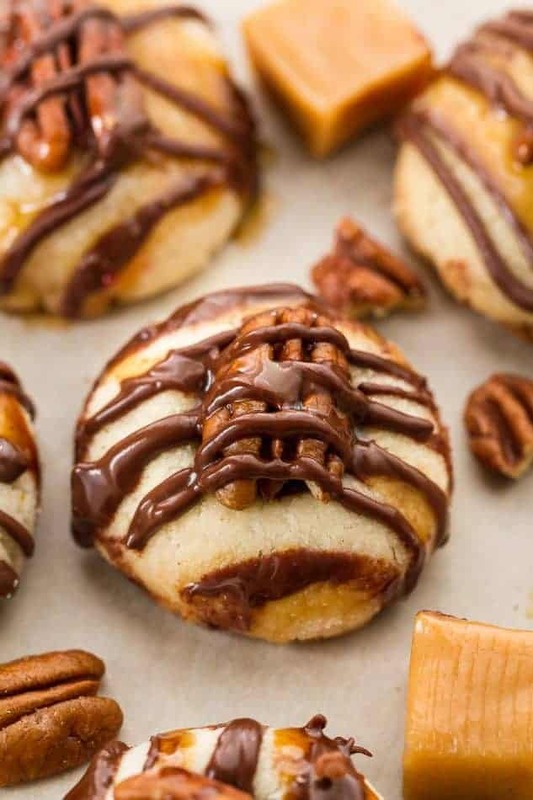 These Pecan Turtle Thumbprint Cookies are just the treat we could all use after a long week. 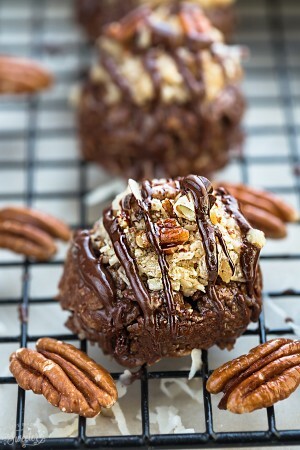 They are totally decadent and would make an awesome addition to any holiday cookie platter. Preheat oven to 375 F degrees. Line 2 large baking sheets with parchment paper or a silicon mat. Set aside. In the bowl of a stand mixer or using a hand mixer on medium speed, cream butter, and sugar together until smooth and creamy. Mix in vanilla and beat until combined, scraping down the sides and the bottom of the bowl as needed. Turn mixer off then slowly add in cornstarch and flour. Turn mixer back on low and beat until the dough starts to crumble and clump together. If dough seems too wet or too dry, add 1-2 tablespoons flour (if too wet) or milk (if too dry - add a little bit at a time) or more as needed. Turn mixer off and gather the dough with your hands to press the dough down and together while kneading and squishing the dough with your palms to form a big ball. This might take about 2 minutes. The warmth from your hands will soften the dough and form together. 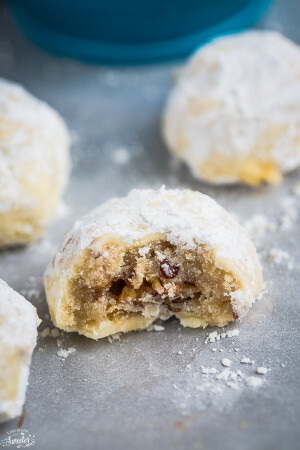 Pickoff 1" pieces and roll and squish tightly into round cookie dough balls (you can roll them in granulated sugar for an extra crunch and sheen if desired) and place about 1.5" apart onto prepared baking sheets. Make an indentation with thumb or using a 1/4 teaspoon in the center of each dough ball. Bake in preheated oven until set but still pale & not golden, about 10 - 12 minutes. Be careful not to overbake, as the cookies will continue cooking as they are cooling. Remove from oven and indent center again if necessary. The cookies will continue to cook as it cools. Allow to dry on the baking sheet for 5 minutes then transfer to a wired cookie rack to cool completely. While the cookies are baking, combine the caramel candies and heavy cream in a small saucepan set over low heat. Cook until the caramels are melted, stirring often until the mixture is smooth. Stir in salt. Spoon about a 1/2 teaspoon of caramel into each cookie center. Top with pecan and drizzle with melted chocolate and salted caramel. Allow the chocolate and caramel to set and dry. Oh no, camera troubles are the worst! Luckily you have these scrumptious cookie photos left. Thumbprint cookies are always a classic favorite! 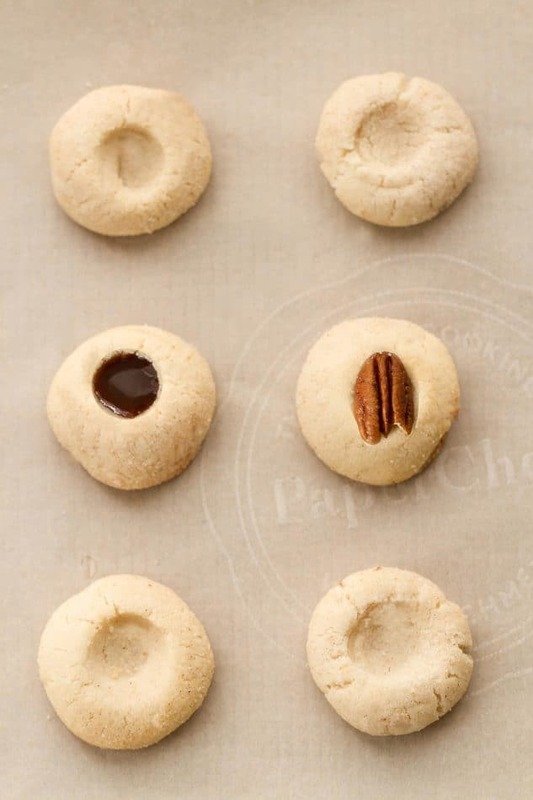 Thumbprint cookies would make any bad day better. These look amazing, Kelly!! Hi Kelly, I love this time of year too, very busy but lots of fun. Your cookies look amazing, love any type of shortbread. Happy Holidays to you and your family! Cookie baking season!!! I need to get started and these thumbprints are a great way to start. These look like sugary bites of bliss all right, and despite your camera being wonky, these photos came out beautifully! 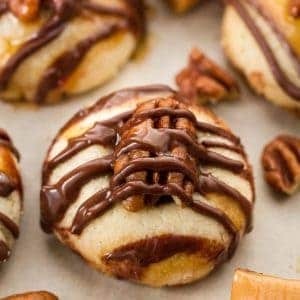 These cookies are right up my alley — I love any and everything turtle! So sorry to hear about camera trouble, Kelly. I also face them sometimes. But still, these photos look marvelous. 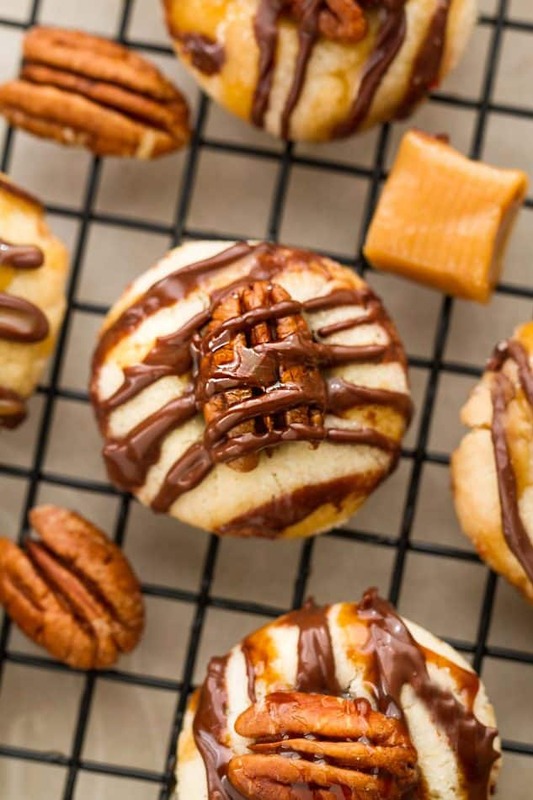 And these thumbprint cookies look mouth-watering good. I wish I could have 3-4 right away. Have a lovely weekend. 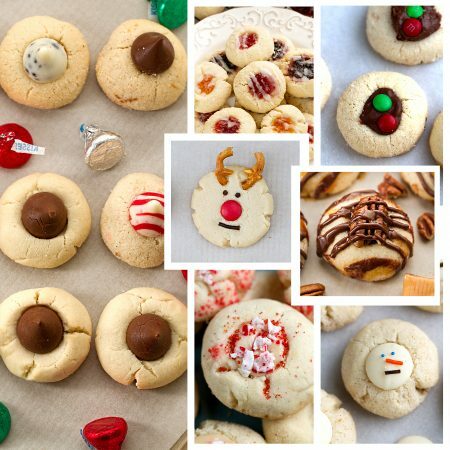 These are the perfect holiday cookies! GREAT MEMORIES…My grandmother used to call the jam filled ones Bird’s Nest cookies. Why? Because she rolled them in chopped nuts before making the thumb print and then filled with jam. Yummy! I also always associate thumbprints with holiday cookies! These are really special…love how you spin different flavors like this. Not only delicious but so good-looking! These look so delicious, I cannot even, which is to say I totally will. 🙂 I also see you have a pecan snowball cookie recipe! That was a family-favorite of mine growing up, and a recipe I make at least once or twice during the holidays. Speaking of which, happy holidays!